I’ve definitely read this book with the intent of reviewing it like four separate times and for whatever reason I just get bogged down every time and forget about it and move onto something more interesting. Why? It’s not boring! It’s well-written! Maybe by the time you finish reading this recap you’ll have an answer for me. Color Me Dark: The Great Diary of Nellie Lee Love, The Great Migration North, Chicago, Illinois, 1919, Patricia McKissack, 2000. This is one of those books that technically takes place in two places—Chicago, at the end, and Tennessee, where it starts. Nellie is eleven and lives there with her twelve-year-old sister Erma, her parents, her uncle, and their grandparents, in the funeral home her family runs. She has an older brother, who’s still with the army, and a young uncle who’s off with the army as well. So things are relatively smooth there—they have to go to a coloured school, which isn’t great, and there are bullies, but otherwise their family is happy and things are going pretty well. Nellie’s father and grandfather are members of the Colored Men’s Improvement Association chapter (which is an organization by the NAACP), since they’re business owners and community leaders, but this occasionally leads to some tension with the local constabulary. But this is less important than the news that Nellie’s uncle Pace is coming home on the train, and everyone is tickled to death to see him again. But the sheriff brings him home, instead—saying he was so drunk he lay down on the train tracks and was hit by a train. They’re all baffled, first, because Pace doesn’t drink, and devastated second. Erma Jean is with him when he dies, and after that she becomes mute. Just flat out can’t speak anymore. She says nothing all through the wake and funeral, even when the far-flung uncles and aunts come into town, including her uncle Meese from Chicago. I’d just like to point out that this book reads like a 1920s-themed Mad Libs with insert-the-kooky-phrase for the first chapter, and after that it reads like a hard-boiled detective novel went rotten and started to smell like sulfur. Less hard-boiled and more, I don’t know, rotten-egg detective novel. 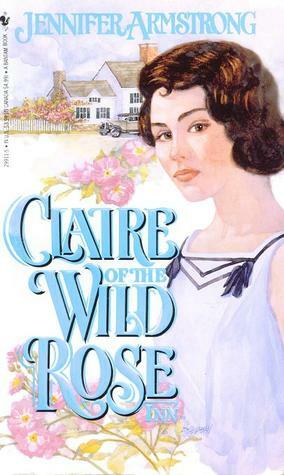 Claire Of The Wild Rose Inn¸ Jennifer Armstrong, 1994. So, there is apparently a book in between this one and the Civil War one, and it’s set in 1898 and it’s about a girl who wants to go to a women’s college instead of getting married. It sounds really boring, and I wasn’t able to find a copy of it anywhere, but maybe one day I will. Until that day we’ll skip right to Claire, which is like every stereotype of a Roaring Twenties-themed novel all wrapped up into one somewhat distressing package. Claire is seventeen years old, and is one of the same Mackenzie family who’s owned the stupid Wild Rose Inn since whatever whatever in the first book. Her father died in the Great War, and ever since she’s been basically running the inn with her semi-incompetent mother and one-year-younger brother. Claire does most of the work while her mother spaces out and dates Jack Handy, the ever-present foes of the Mackenzie family and former owner of the Ship tavern, which he sold and the new owner made into a speakeasy. So as the first chapter opens, Claire is enjoying an illegal speakeasy with her brother Bob (who is a drunk, at the age of sixteen, which must be quite the effort when alcohol is illegal) and her friend Kitty Trelawney when she makes the acquaintance of a “handsome newspaper man” named Hank Logan, who’s in town investigating its rum-running history.